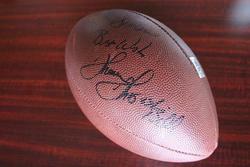 I signed this football for a fan at the request of my associate John Mariacher. I understand that the fan lives in the UK and is a big Bills fan. The inscription reads, "To Simon, Best Wishes, Thurman Thomas #34, Bills." Words cannot fully express how special this is to me. I have been a bills fan for over twenty years and the Bills have been a huge part of my life. Thank you, Mr. Thomas, for taking the time to do this for me and thanks to all at Collectors Proof for making this possible. I am forever in your debt.